In an attempt to stop a crime spree in which the man pictured apparently goes into secure areas of small markets and restaurants and takes employees’ possessions, the Santa Barbara Police Department is asking for the public’s help in identifying him. Several commercial businesses around the city contacted police in recent weeks after the burglaries took place, and police assembled security camera photos of the alleged thief. 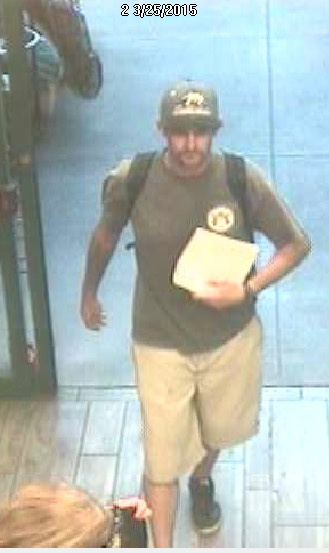 Please contact Detective John Ingram at (805) 897-2327 or jingram@sbpd.com if you recognize this person. Anonymous calls may be made to (805) 897-2386.